John Richard Cooper, retirement notice, continued. Much of what we can say about John Richard Cooper was told to us by Don Roach of Victoria, Australia, a grandson of his sister, Edith Sarah Granari (nee Cooper). Additional information has been located in Find My Past military records. John Richard Cooper was born in 1881 at Bottesford, and died between 1944 and 1947, possibly in Bloemfontein, South Africa. 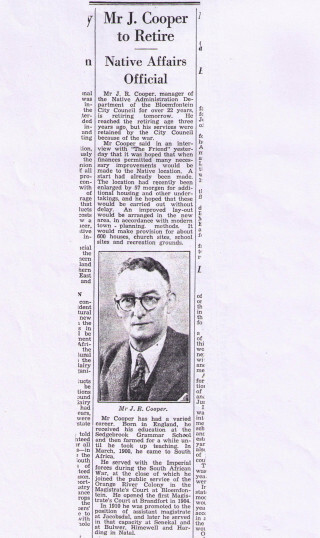 He was educated at Sedgebrook Grammar School, and was a teacher for a short time at St. Luke’s School in Nottingham. His father, John Thomas Cooper, was a tailor with premises on Chapel Street, Bottesford, and was a well known bugler with the Belvoir Volunteers. He died in 1904 and was given a military funeral at St Mary’s, Bottesford. John Richard Cooper enlisted on 23rd August, 1899, at Lichfield, aged 18 years 4 months, as 3933 Army Ordnance Corps. His Attestation papers record that he had already been a member of the 1st VB Leicester Regiment (“VB” may refer to the part-time Belvoir Volunteers, where he could have been alongside his father), and gives his profession as a clerk. 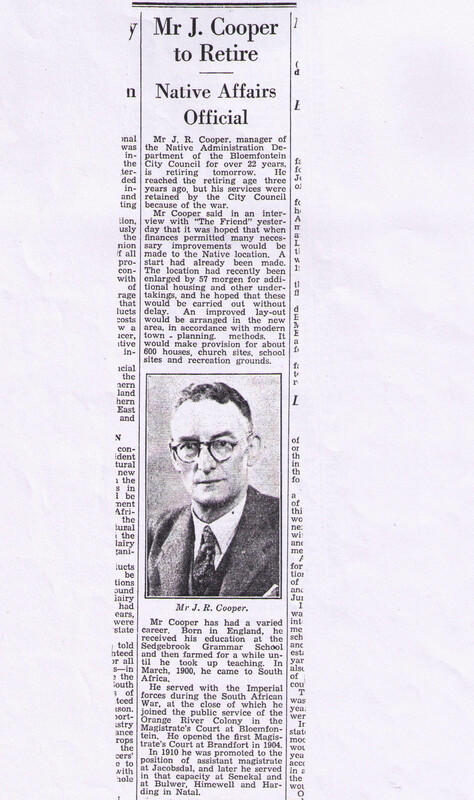 A newspaper report from the time of his retirement states that had (also) been a farmer. He then served in the Imperial Forces in the South African War (the Boer War) from 1900 to 1902. After leaving the army at the conclusion of hostilities he stayed on in South Africa, joining the court service of the Orange River Company, and opened the first Magistrate’s Court at Brandfort in 1904. He spent all his working life in South Africa. He married Alida (or Alice) Dorothea Van De-Spey. They had three children, two of whom were named Charlotte and Richard. He returned to England in 1916 with Alida and the children, and then served for two years in the First World War. 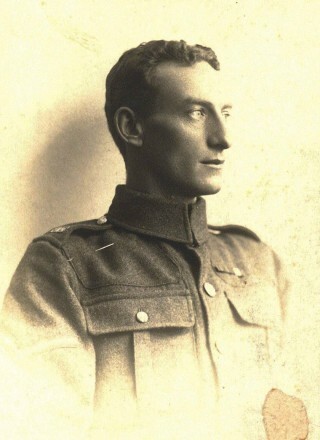 He enlisted 21st July, 1916, at Woolwich, aged 35, to become 18132 Army Ordnance Corps (New Force). He served in France and rose to become a commissioned officer, according to a note added to his original Attestation papers, which were still being used during WW1. (Unfortunately no other WW1 service records were located in FMP.) He and his wife had the headstone erected in St Mary’s churchyard, Bottesford, in memory of his father and his brother Thomas Harold Cooper who had lost his life during the fighting in 1917. In 1919 he and his family returned to South Africa, and he served as manager of the Native Administration Department of the Bloemfontein City Council for 22 years before his retirement. In this post, his aim was to use modern town-planning methods to improve housing and social provision in the ‘Native Location’. The date of his death is slightly uncertain, but it appears that he died a few months after his retirement. The Grantham Journal reported his death, giving his age as 64, from which it can be deduced that he died in 1945 or 1946. Fought in the Imperial Forces during the Boer War, 1900-1902, having enlisted on 23rd August, 1899, at Lichfield with the Army Ordnance Corps, then re-enlisted on 21st July, 1916, at Woolwich to serve in WW1 before returning to South Africa in 1919. His service number during his first period of military service was 3933; during WW1 he was 018132 L/Capt in the Army Ordnance Corps (New Force). After the end of the Boer War he stayed in Africa and joined the public service of the Orange River Colony, becoming an assistant magistrate from 1910. After returning to Africa following the end of WW1 he was manager of the Native Administration Department of the Bloemfontein City Council for 22 years, before his retirement. Here he sought to use modern town-planning methods to improve housing and social provision in the 'Native Location'.